I just finished part two of the Silk Road British Poetry readings. We featured eleven poets in total across the two live online readings. With this, I have accomplished what I set out to do. 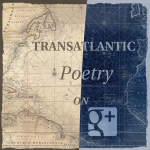 Now that my personal mission has been fulfilled, it is time for Transatlantic Poetry on Air to enter a new phase, helping other poetry organisations to fulfill their own missions, playing Virgil to their adventures in this realm of new technology. All of this is to say that I am now both done and just getting started. Through this experimental reading series, we discovered a great interest in the unique combination of convenience and global reach that this format provides for both poets and poetry-lovers, clocking up over a thousand views of our videos from all over the world since our launch in May. We also attracted the attention of organizations ranging from the US Poetry Foundation to an Italian-language arts journal. Several such organisations have answered the call to partner with us to make live on-air poetry readings a reality for their own poets and audiences, including the Prague-based literary journal B O D Y, who will be hosting a reading in November, Fjords Review, Rattle, and the Scottish Poetry Library. For now, my focus and attention for now will go into supporting these groups to make their readings a great success. So, look for some new faces in the coming months as we train these hosts. I will probably host readings myself again in 2014, but for now I am excited to see the reading series expand and take on a life of its own in this way, and delighted to be helping these journals and pro-poetry groups to increase the global reach of poetry. Just for this moment, though, I am pausing to celebrate six months of coordinating calendars, supporting poets with new technology, promoting events, documenting best practices, and, of course, hosting the live readings themselves. It has all been worth it to do my small part to help "knit the poetry world together" (as Esther Morgan so sweetly put it). Mission accomplished. Where this goes next is up to the generosity and good work of the poetry community at large. Thanks for tuning in. Here's to a bright future for global online poetry read aloud. Categories: Community and Poetry. 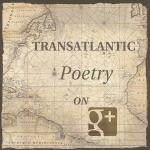 Tags: Silk Road and Transatlantic Poetry.